William Gladstone noticed that ancient Greeks, like Homer, referred to different colors than what we see. Homer wrote of the wine-dark sea, the bronze sky, wine-colored oxen and green honey. Xenophanes said the rainbow had three colors: purple, green-yellow and red. Empedocles, Democritus and the Pythagoreans thought the only colors were white, black, red and yellow. Pliny, Quintilian and Cicero wrote that until Alexander’s time, the Greeks only painted with four colors. Gladstone reasoned that early Greeks were color blind. Lazarus Geiger made a study of color references in ancient sources. He claimed that over the centuries languages gradually developed a color sense in the sequence: black and white; red; yellow; green and lastly blue. A hundred years later, Brent Berlin and Paul Kay rediscovered that languages evolve as they discern colors with the sequence: black and white; red; green; yellow; and then blue. Prehistoric artists used black (charcoal); white (ground calcite) with red and yellow ochre. Of course the animals they painted are not blue and blue paints are hard to make. Later, during historical times, people treasured blue objects. The Sumerians prized lapis lazuli. The Egyptians made a blue cobalt glass. The Babylonian Ishtar Gate has blue tiles. Tutankhamun’s death mask is made of gold and lapis lazuli. Was the sky really bronze 3000 years ago? (1) The left frame is a NASA sundial as seen under white light on Earth. (2) The next frame show the sundial in Martian daylight. (The shadow shows the Sun’s angle). The blue tab looks red; green seems pink; red-brown shows as tan; tan seems yellow, gold is grey and off-white is white. We see few blues today on Mars. (The hematite blue-berries on the Martian plains are false color images to show their mineral composition. Similar hematite berries on Earth appear grey-brown.) (3) The next frame shows a sunset on Mars, as reconstituted with camera filters. The Sun is white surrounded by blue tinges but the rest of the sky is bronze. The Martian atmosphere is thick with rusty dust that absorbs the blues and scatters the red. (4) The right frame shows an Egyptian tomb painting from more than three thousand years ago. The sun-god Ra rides his boat across the tan sky. The sun-disk is red and the river is wine colored. The Egyptian artist used white and blue in the picture, but not for the Sun’s disk or the sky’s color. Earth’s sky today is light blue and sea is often blue because the modern Sun is white (not red like ancient stars) and air molecules scatter blues and absorb the reds from sunlight. (1) If the Sun was actually red 3,000 years ago, the ancient’s would have seen a bronze sky. (2) If air molecules were smaller, the atmosphere could have absorbed blues and scattered reds. Support for reason #1. With telescopes, we see the distant past. In general, the more ancient the light spectra, the redder it is. The most-distant galaxies shine and absorb light at less than 1/10th the frequencies emitted and absorbed by modern atoms. Throughout cosmic history, we observe how the absorption and emission spectra keep shifting towards the blue. Evidently modern atoms emit / absorb higher frequencies than ancient atoms. Support for reason #2. When we compare galaxy shapes at many ranges, we observe distinct clumps coming out from point sources. Billions of galaxies intrinsically grew into local growth spirals as the space matter takes up, its inertial properties and it clock frequencies kept on changing. Cosmic history shows that intrinsic changes in matter are real. The early earth was evidently a tiny planet, since the continents fit together on a minuscule globe without major seas. The youngest crust lies along a global expansion seam that continues to form new sea floor. The picture of the relative age of the ocean basements is from NOAA. Red is the youngest seafloor, next to a global expansion seam, and blue is the oldest). 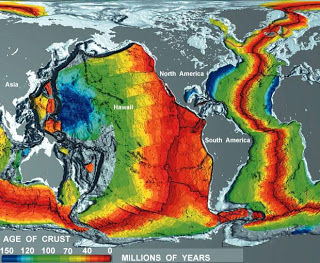 The theory that the earth swallowed two thirds of its crust is denied by the layered, undisturbed sediments in the “subduction” trenches. Earth’s core atoms must be expanding more than its surface atoms for the earth to grow in size. (Zechariah 12:1 states, in Hebrew, that God continues in unbroken continuity to lay the foundations of the Earth.) Changing Earth Creationists differ from Young Earth and Old Earth creationists because we accept the visible evidence that matter continually changes its properties. The gif of how the Earth continued to grow in size as new oceans formed, the continents fitting together on a tiny globe, is from Michael Netzer who permits distribution with attribution. Scientist: You are speculating with evidence from billions of years ago and subduction is accepted by virtually all scientists. We should accept what is visible, that galaxies intrinsically grew as the stars continued to accelerate outwards, the star circuits not closing as the properties of matter kept shifting. What is visible confirms Creation. God created the plural heavens and Earth first. At that stage the Earth was formless until God continued to command light to continue to be. He did not form the Sun, Moon and stars until half way through the creation week and continued to make them into things that spread (Hebrew raqia). Billions of galaxies started out as naked midgets, then globs packed tightly with close together stars came out, spread out as their atomic clocks accelerated. What is visible in the distance is supported by the simple evidence that the Earth continually expands along a global, volcanic, undersea expansion seam. Scientist: We measure seconds with precise atomic clocks. We use these to mathematically derive thousands of precision empirical units and mathematical constants. We measure the age of the universe with precision instruments. The universe cannot be 6,000 years old. Peter predicted the first law, arche ktisis, of the last days as “all things that exist remain the same – panta houtos diamenei.” Peter predicted how mockers will obfuscate the age (literally out-old) of the plural heavens because they hold this idea. Scientists measure many things that only exist in the symbolical world of mathematical reality. They were contrived with the notion that atoms are perpetual motion engines. No wonder their universe is almost 99% invisible. They speculate that the vacuum of space time spreads out and stretches passing light. No one has ever observed a spreading vacuum or light changing frequency as it passes through a void. What is visible is that matter is always shifting its properties relationally throughout cosmic history.